I'm not sure who was having more fun, whether it was Chris taking the picture or Taylor posing. I couldn't pick just one so Chris suggested a collage of my favorites. These are from Christmas morning, so I love that bokeh from the tree. Merry Christmas from our house to yours! May your day be filled with joy and laughter and may you remember the true meaning of the season! 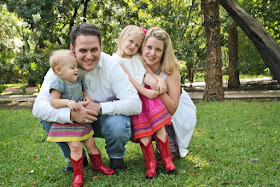 I have a wonderful family and two beautiful girls to remind me of the blessings that God gives us each day. No one can ever explain the excitement you get as a parent when your child starts to understand the holidays. I loved that Taylor finally understood Halloween this year and really knew what she wanted to be and even started picking out what Chris and I were going to be too. Christmas has been a real adventure. While she is great at remembering that we are really celebrating Jesus’ birthday, it doesn’t keep her from saying ‘I ask that for Christmas’. Commercials/newspaper ads have made their affect on my little one and she is constantly informing us about items she wants to ask for or for Santa to bring her. She even did a great job when visiting Santa and told him that she wanted Tinkerbell. So as everyone asked her what she wanted Santa to bring, it slowly changed to Ariel and then more specifically an Ariel with the little Flounder. I started to panic thinking that Santa would not be aware of this change and made sure he had her updated wish list. I even had all my Christmas shopping done too! Then over the weekend my little dear’s Santa wish changed back to Tinkerbell and then to a Tinkerbell castle. Another BIG panic set in and luckily Chris was able to help me let Santa know of the change but I’m still not sure what Tinkerbell castle is and Santa doesn’t either. When I saw this comic yesterday it made me laugh. I have always loved Family Circus and Baby Blues, but truly appreciate the humor now that I am a parent. I can’t wait to see what future years bring us, but also can’t wait to tell Taylor this story when she becomes a parent. I would love to send each and every one of my blog followers a Christmas card, but since I can’t I thought I would share it here with you. May this holiday season bring you love, joy, and faith! This isn't the clearest picture, but I had to make it our Taylor Tuesday. Taylor couldn't wait to see her cousins this past weekend and I took this picture without having to ask her to smile. She didn't want to let go of Johanna's hand as soon as they arrived. I love to see her enjoying her cousins as much I as do mine. Now let's just hope that Nana's house has recovered from three(and an infant) granddaughters! I have been trying so hard to catch Elizabeth smiling on camera, but she can go from smiling and cooing to a full blown fit in a matter of seconds so I often just enjoy those sweet smiles/sounds while they are happening. Here is one of my attempts to catch a smile. She is actually looking at me but I was holding the camera away from my face so I could get her to smile. And yes... I am one of those parents that will do any sort of strange thing to make my kid laugh/smile. I still have 30 minutes until midnight, so it's still officially Tuesday right??? Onto our picture of the week... Taylor is getting into the holiday season and decided that she wanted to be a nutcracker the other morning. I'm not sure what about this makes her a nutcracker, but I love the imagination and creativity. She even had to where her ensemble in the car on the way to school. Little sister was not as enthusiastic about the getup when Taylor stated beating the pan in the car. It will be her turn someday. I have a feeling that many of my Taylor Tuesdays or elizabeTHursdays will have both of the girls in it. I often feel like I’m watching ‘Look Who’s Talking Too’ while watching the girls interact. I can only imagine what is going through Elizabeth’s mind most of the time and Taylor tells me. I guess my love for dance and music has rubbed off on Taylor because today she started her first dance class and...LOVED it!!! I can't wait to watch her each week! Nursing was MUCH easier this time around but you also do just fine with a bottle when Momma needs a break! In the past week you have started to have more ‘wake’ time during the day. During this time you like to just look around(still a bit spastic in movements) and sometimes we get to hear your sweet little ‘la’ noises. You love to watch Taylor and she is normally right next to you during this time. You sleep through anything and any noise that your sister makes. It amazes everyone how laid back you are and you only cry if you are hungry(boy do you let us know), dirty diaper, need to get a burp out, or if your clothes are being changed. Unlike your sister, you do not like to be ‘nakee’ right now. You have even given me a few 6 hour stretches at night of sleep. This is a HUGE improvement from some of the 45 minute intervals that showed up around 2 weeks old. You love to snuggle with whoever will hold you, but mostly Dad. The two of you could spend the entire weekend in the recliner sleeping away. I am amazed at the ways he has figured out how to play with Taylor while still snuggled in the recliner with you. Our most common question(besides does she look like Taylor) right now is what we are going to call you. I guess no one actually goes by the name Elizabeth, but some form of nickname of it. My best friend did some research one day and came up with a list(bad ones omitted) of possibilities. Here are some of your potential nicknames: Bee, Beth, Bethey, Betsy, Bette, Betty, Ela, Eli, Eliaz, Elisa, Elise, Eliza, Ella, Elle, Ellie, Elsa, Elsie, Ely, Isabel, Iz, Izabel, Izabeth, Izzie, Izzy, Leeza, Libby, Lila, Lili, Lilibeth, Lilie, Lilla, Lillah, Lilli, Lillibeth, Lillie, Lilly, Lily, Lisa, Lisbeth, Lisette, Lissy, Liz, Liza, Lizbee, Lizz, Lizzie, Lizzy, and Zabe. Guess only time will tell. Quote of the month came from Taylor when she shared her beloved bunny with you and you spit up on it she said ‘Mommy, she milked on my bunny!’ This might not be too funny to non-parents of the world, but it had me rolling with Taylor’s creativity of words and still makes me laugh. I wonder if this is one of those moments that we will embarrass Elizabeth with when she brings boys home for us to meet. After your chair picture, Taylor had to have her turn. And for a little flashback comparison. Here are some pictures of Taylor during her first month. There’s no denying they are sisters, but I see Elizabeth’s small differences. I can’t wait to see what her personality is going to be like! Just one of Elizabeth's funny faces that I enjoy.